A civil society report released in late October criticised the World Bank for its failure to commit more resources to energy access, arguing that its approach to energy investment does not do enough to end energy poverty in developing regions. The report, Funding Clean Energy Access for the Poor: Can the World Bank Meet the Challenge?, co-published by Bank Information Center Europe (BIC Europe), the Swedish Society for Nature Conservation (SSNC), and the Big Shift Global campaign, pointed out that lending linked to improving energy access accounted for only 13 per cent ($1.5 billion) of the Bank’s energy lending portfolio in fiscal year (FY) 2016. It called for the Bank to introduce specific targets to scale up investments in energy access, including at least $5.75 billion in annual funding for energy access and investments that enable 15 million people to gain connections annually. The World Bank’s 2013 Energy Directions paper outlined that its, “energy practice will be centered on contributing to the achievement of … the UN Sustainable Energy for All initiative [SEforAll]”, which includes the ambitious target of achieving universal energy access worldwide by 2030. The target is also included in the Sustainable Development Goals (SDGs) under SDG7, which is aimed at providing access to affordable, sustainable, and reliable energy for all. However, the Funding Clean Energy Access for the Poor report argued the Bank needs to take additional steps to prioritise energy access over investments in energy for export, particularly in energy poor countries in Sub-Saharan Africa and Asia, in order to help reach SEforAll goals. 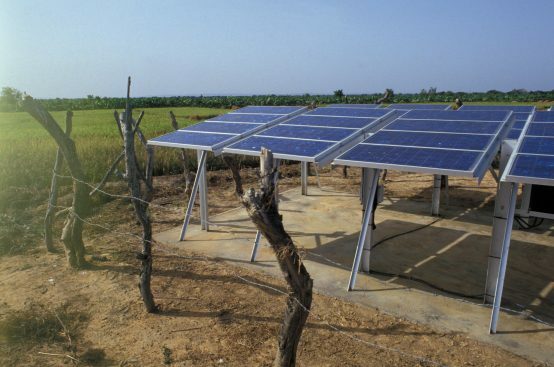 An October report by the International Energy Agency (IEA), a Paris-based intergovernmental organisation, has shown that investment in distributed renewable energy technology, including off-grid and mini-grid electricity in remote rural areas of developing countries, is essential for meeting SEforAll’s goal of achieving universal energy access. It documented that 1.1 billion people worldwide remained without electricity access in 2016, and that under current trends this number will decline to 700 million by 2030 – with 60 per cent of this improvement in access projected to be covered by renewable energy. To reach universal access by 2030, the IEA report suggested that 90 per cent of the remaining 700 million connections would need to be provided by renewable technology, with off-grid and mini-grid technology playing a key role in energy poor countries with limited conventional grids. The Bank’s investments in off-grid and mini-grid technologies have historically been a peripheral area of its energy policy. For example, a 2016 report from the World Bank Group’s (WBG) Independent Evaluation Group (IEG) noted that between FY 2000-2016, WBG investment in off-grid electrification was estimated to be only about 2.5 per cent of its overall lending in the electricity sector (averaging $87 million a year). The IEG report noted: “No discernible trend is found in these commitments” over the period included in the review.